Continuing with the adventures of Old West heroine Breanna Baylor, book six of the Angel of Mercy series begins with the planning of a wedding -- between Breanna and the legendary Stranger, whose true identity has now been revealed. Before the wedding, however, John's best man, Chief U.S. Marshal Solomon Duvall, disappears. 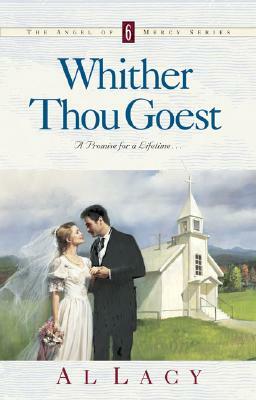 And after the wedding, both John and Breanna -- who has pledged, "Whither thou goest, I will go" -- put their own lives in danger as they set out to find him. Description: All books from our inventory are good to like new condition, unless otherwise stated. Satisfaction is guaranteed. Similar books you may find of interest. 10:00 - 6:00 Monday - Sunday, except for New Years Day, Easter, July 4, Thanksgiving and Christmas, when we are closed, and we typically close at 4:00 PM on Christmas Eve and New Years Eve.